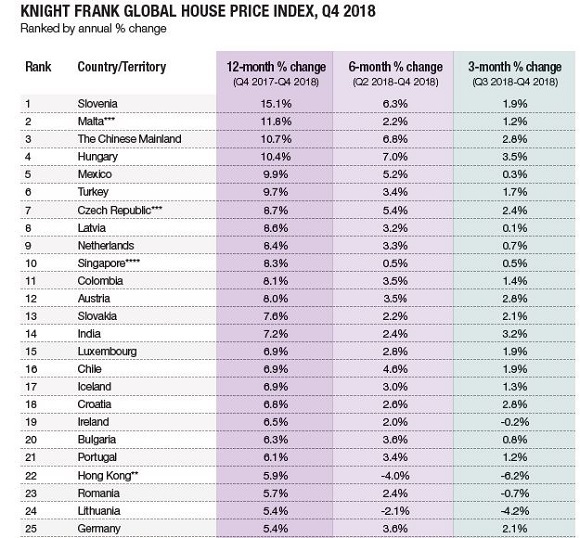 Slovenia leads the Global House Price Index for the first time, recording 15.1% growth over the 12-month period. The index increased by 4.3% in the year to December 2018, its lowest rate of annual growth since Q3 2016. Hong Kong, slipped from first to 22nd place as average prices tumbled 6.2% in the final three months of 2018. Only eight of the 56 markets tracked saw prices decline in 2018 and half of them were in Europe. With 2019 expected to see greater economic uncertainty, heightened market regulation and a rising cost of debt in major economies we expect the rate of price growth globally to moderate further next quarter. Data for Australia, Austria, Belgium, Bulgaria, Croatia, Czech Republic, Denmark, Estonia, Finland, Germany, Greece, Hungary, Israel, Italy, Japan, Latvia, Lithuania, Luxembourg, Malaysia, Morocco, New Zealand, Poland, Romania, Slovenia, South Africa is to Q3 2018; data for Cyprus and India is to Q2 2018. Although 86% of the countries and territories tracked by the index recorded a rise in prices in 2018, the index’s overall rate of growth continues to moderate. Average residential property values across 56 countries and territories increased by 4.3% in the year to December 2018, the lowest annual rate of growth recorded by our index since Q3 2016. Slovenia (15.1%) now leads the index for the first time. Long term frontrunner, Hong Kong, slipped from first to 22nd place as average prices tumbled 6.2% in the final three months of 2018. The Chinese Mainland crept back up the rankings, whilst Finland and Sweden headed south. We reported last quarter on rising prices in Central and Eastern Europe (CEE) which has been confirmed by Slovenia’s ascendancy into first place. The IMF estimates the country’s economy expanded by 4.5% in 2018 and as a member of the Eurozone, interest rates remain low aiding housing market performance. The latest data from the Slovenian Statistical Office shows sales volumes have almost doubled from 5,700 in 2009 to over 10,000 in the year to Q3 2018. Hong Kong’s slide was an expected consequence of: a further tightening of housing policy in June 2018; a volatile stock market; a strengthening currency; and, the global trade dispute weighing heavily on buyer sentiment. Despite significant disparities across the Chinese Mainland, the outperformance of some cities such as Xi’an helped lift annual growth from 8.9% last quarter to 10.7% at the end of Q4 2018. Put in context though, some cities were registering annual growth of 30% to 40% two years ago and although prices are still rising overall, sales across China are expected to decline in 2019 and the loosening of property regulations will be a slower process than expected. Only eight of the 56 markets tracked saw prices decline in 2018 and half of them were in Europe; Switzerland (-0.1%), Italy (-0.8%), Sweden (-1.5%) and Finland (-2.9%). But Europe’s 2018 figures present a mixed picture – Central and Eastern European countries are out in front, Portugal (6.1%) is now outpacing Germany (5.4%) and the UK (2.5%) is only marginally ahead of Greece (2.4%). Boosted by Mexico (9.9%), Colombia (8.1%) and Chile’s (6.9%) upturn, Latin America proved the strongest-performing world region in 2018. Africa at 1.6% was the weakest. If you’re thinking of buying or selling, or would just like some property advice, please do get in touch. Important Notice. © Knight Frank LLP 2019 – This report is published for general information only and not to be relied upon in any way. Although high standards have been used in the preparation of the information, analysis, views and projections presented in this report, no responsibility or liability whatsoever can be accepted by Knight Frank LLP for any loss or damage resultant from any use of, reliance on or reference to the contents of this document. As a general report, this material does not necessarily represent the view of Knight Frank LLP in relation to particular properties or projects. Reproduction of this report in whole or in part is not allowed without prior written approval of Knight Frank LLP to the form and content within which it appears. Knight Frank LLP is a limited liability partnership registered in England with registered number OC305934. Our registered office is 55 Baker Street, London, W1U 8AN, where you may look at a list of members’ names.